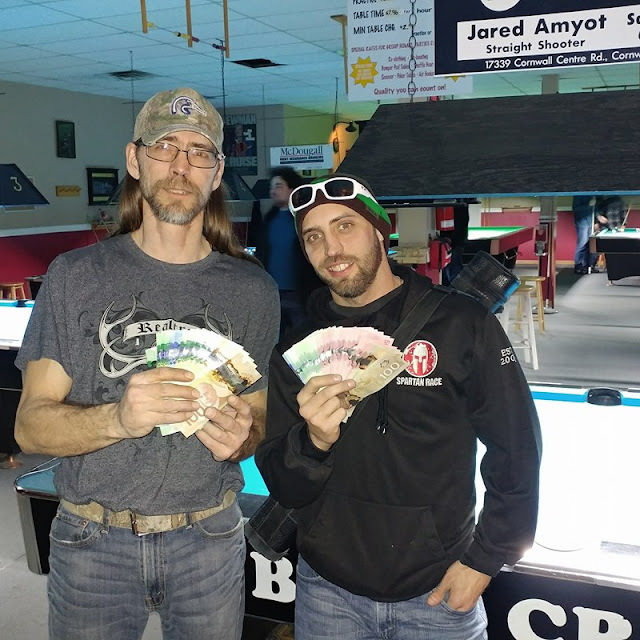 Saturday February 24th Rack-M-Up Billiards held a rare event these days in Ontario, a AAA and under non-handicap 9 Ball tournament. With only about two weeks notice players from Ottawa/Gatineau and Montreal came to participate. Originally the field was slated to be filled at 24 however do to overwhelming interest owner of the room and tournament director Doug Disotell opened the field to 32. The entry was $40 it was races to 7 on the winners side and 6 on the losers, as well as alternative break. Two of the betting favourites met up right away as Roy sent Dorais over to the one loss side in the first match. Marc Malette also found himself on the losers side at the hands of Do Gauthier a newly ranked AAA in the Québec Federation who has been playing well as of late. Most of this field was was fairly evenly matched despite no handicap which made for an entertaining day. That being said some lower ranked players such as Daniel Sumon, Josh Levac, Cullen Arihote and J.R Cook stepped up for chance at gaining some experience and potentially as we like to say around here, "ruin someone's day." Levac and Arihote both were able to accomplish this feat both beating players ranked multiple levels above their own. Local favourite Jody Roy was on an impressive run beating two of the stronger players in the field, Luc Comptois and Dorais before meeting up with Mehdi Harraq in the winners side final 4. Harraq knocked Roy over to the losers side in this bracket and met up with Do Gauthier in the winners side final. Gauthier was down 3-0 to myself and kicked it up a gear to beat me 7-3. He carried this momentum into the hot-seat match making quick work of Harraq 7-3. 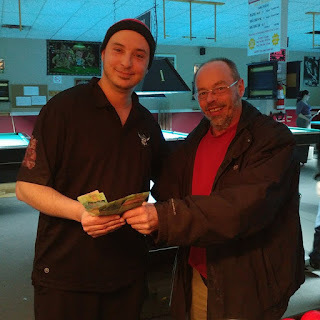 In the final Gauthier met up with local player Malette who worked hard winning 8 matches on the losers side to have his chance at redemption. It was looking good early for Malette as he lead 4-1 in this race to 7. However as he was doing all day Gauthier came all the way back to win 7-5 and win his second tournament in as many months. It should be noted that Malette has taken several years off playing and has recently come back to competitive play, this is his second time finishing in the top 2 in the last two events here. Congratulations to all the winners! Also a big thank you to all the Québec players who came down, many of whom have been big supporters of Cue Sport Nation. It was a pleasure to see the same people support a great tournament in my home room. Doug Disotell did a fantastic job running the event smoothly as well as being the referee. There was not a single complaint all day and from what I heard from the players I know these tournaments can be a regular success. Falcon Tour In Drummondville This Weekend!